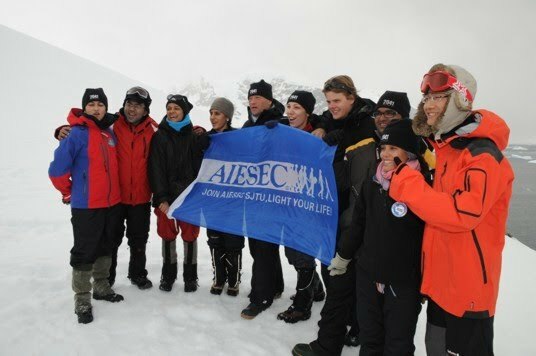 "AIESEC is an international non-governmental not-for-profit organization established in 1948 that provides young people with leadership development and cross-cultural global internship and volunteer exchange experiences across the globe, with a focus to empower young people so they can make a positive impact on society. The AIESEC network includes over 100,000 members in 126 countries and territories. It is the largest youth-run organization in the world. AIESEC is a non-governmental organization in consultative status with the United Nations Economic and Social Council (ECOSOC), is affiliated with the UN DPI ( and UN's Office of the Secretary-General's Envoy on Youth, member of ICYMO, and is recognized by UNESCO. AIESEC's international headquarters are in Rotterdam, Netherlands." Based on what could be seen of the flag in the photograph, I made the attached graphic. I know the logo is accurate, but I couldn't see all of the inscription beneath. I added the "SJTU" to the flag, leaving blank, blue spaces in place of the folds in the fabric of the flags. The actual flag doesn't have those blank spaces; the are no folds to speak of. It also doesn't have the "up" in "light your life". Instead it has more space above those letters and around the edge, where only the white stripe continues. I'm unsure how to mangle your image to bring that about, though; it all seems slightly out of ratio but I don't know what's causing it. I don't know what this flag is for, though. If the SJTU in question is the Shanghai university it would hardly seem like a general AIESEC flag. Also, in a general one, one would indeed expect the word "up" in that slogan; as it is, it looks like a translation of the slogan's words from a different language. There may also be an exclamation mark at the end of that line. This time, I've increased the spacing between the letters in the "JOIN AIESEC..." slogan so that the spacing of the lettering matches more closely what I'm seeing in the photograph - namely, that the slogan begins under and slightly before the "A" in the logo, and the exclamation point at the end of the slogan comes right around the footsteps of the silhouette closest to the fly. I also put more blue spacing between the logo and the slogan. I resized the overall dimensions of the flag to 1:2 from the 3:5 that I had originally. Doing so also allowed me to more accurately place the logo on the flag, leaving blue space between the fly and the first silhouette, and giving me more room on the hoist end to extend the white bar. Overall, I think this is probably the closest that we're probably going to get. I also agree with the idea that this is probably not the AIESEC corporate flag, but more likely specific to one of their chapters, presumably at a university whose initials are "SJTU." I think it's likely that the overall corporate flag is very similar, probably just the logo on a blue field and without the slogan, but we don't have any photographic evidence of that yet.